Intermagnetics Normal Bias Position I C60. Not previously stored in a case. Erasure safety tabs intact. These were removed on 10/09/14. This tape is labeled Swamp Patrol on both sides, with a big X to the left of the name. The first side also bears “20-1”, and Side B, “20-2”. Hal’s handwriting/printing over whited-out tape labels. Plus there are asterisks in the lower right on each side. Personnel: David Mattingly, Debbie Jaffe, Hal McGee. These are stereo room recordings, made with a stereo microphone connected to a cassette deck. No date on the tape labels, but December 1983 can be presumed. Clarinet played by Deb (usually in the center of the stereo field), Dr. Rhythm drum machine (left of center), Casio MT-11 polyphonic keyboard (left of center), and a Casio VL-1 (VL-Tone) (on the right). - At about the 13:00 minute mark I hear sounds that definitely were on the Swamp Patrol 84 cassette. David Mattingly’s guitar playing can be heard on this piece, not heard previously on this tape, left side of the stereo field. It sounds like Hal & Deb are playing two Casio VL-1s together through the same amp, on the right. Not sure, but one of the VL-1s might be plugged into Mattingly’s amp on the left. 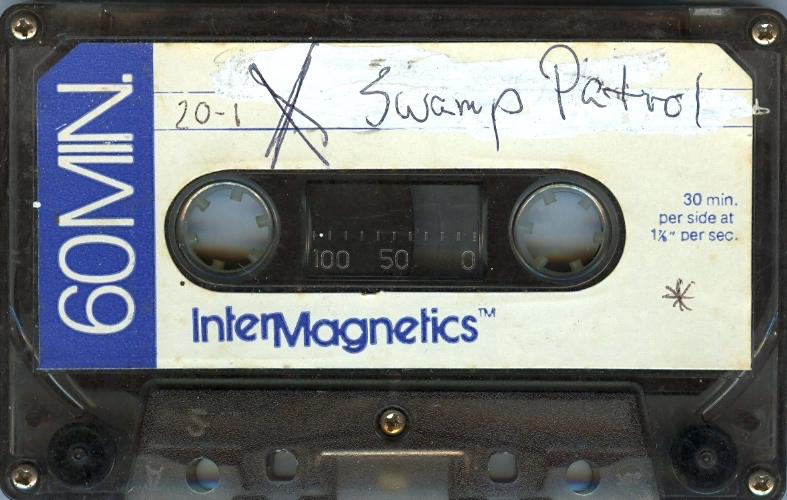 - The piece at 17:20 was also on Swamp Patrol 84. Mattingly on guitar, Hal on vocals, Deb presumably on VL-1 (there might be two of them played). - The song at 22:08 was on Swamp Patrol 84, probably not in its entirety. Mattingly on guitar, Deb on VL-1(s). It sure sounds like one of two VL-1s is being played through Mattingly’s amp. Hal is singing the words and melody of “Crystal Ship” by The Doors. - 26:16 - Mattingly on guitar, Casio MT-11 (presumably played by Hal), and Deb on clarinet. On Swamp Patrol 84, in excerpted form. Casio MT-11 (on the left, played by Hal), Mattingly on guitar, Deb on clarinet. Not used on Swamp Patrol 84. - 1:10 - David on guitar, Hal on vocals, Deb on MT-11. Most of the sound is on the left. Not used on Swamp Patrol 84. - 3:24 - Deb on MT-11, David on guitar, Hal on vocals. Abandoned at 3:57. - 3:58 - Deb on MT-11 (left), guitar, Hal and David on groaning vocals. Part of this was used on Swamp Patrol 84, from about 6:40 onward Part-way through there is a right channel drop-out. -7:49 - Definitely used on Swamp Patrol 84, “Swamp Woman Lament”. David on guitar, Hal on MT-11, Deb on vocals, Dr. Rhythm drum machine. Hal adds a vocal accent at about 10:19 and later at 10:52 and then a few seconds after that. - 12:00 - Dr. Rhythm, McGee on MT-11, Jaffe on clarinet, Mattingly on guitar. Not used on Swamp Patrol 84. - 16:35 - Sound of amp being turned on and off, used on Swamp Patrol 84. - 17:02 - Definitely used on Swamp Patrol 84 (not the entire thing) Two Casio VL-1s (far right), played by Deb & Hal, David on guitar (far left). - 27:26 - Casio MT-11, sustained notes. Only sound heard. Sounds different than the previous recordings on the tape. Might be mono.